» Microeconomics - Why Study Economics? What is happiness? I don’t think anyone can pinpoint the definition of this word because there are so many ways to be happy. One thing for sure, happiness is not proportional to the amount of wealth in one’s possession. In fact, we can be happy from very simple things that are given to us. For me, happiness comes from the ability to appreciate what you have. Coming from this perspective, being well-off sometimes just doesn’t do the good. Well, this is the case with me at least. When I first came to Ukraine, my family didn’t have much money. We were living in a very small two-room flat. My dad was finishing his PhD thesis, so we had to live off the money he had earned before that. It was difficult, but during the first summer my dad would still drive the whole family to the local McDonalds to buy the cheapest ice-cream they had on offer: vanilla cone that back then cost around 20p. My sister and I would have one ice-cream each because that was all my parents could afford. Looking back, those were the happiest days in my life. Now my family is in a much better position; my parents can afford to send me to England to study and I have Häagen-Dazs instead, but all these are not necessarily as valuable as the vanilla cones I had when I was nine. I definitely appreciated everything I had more back then. Is this economics explained in one picture? 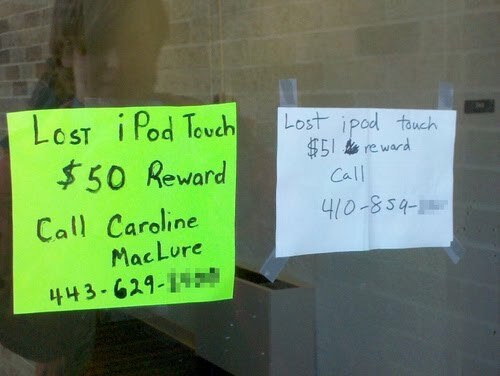 Who would you give the iPod to? You are currently browsing the archives for the Microeconomics category.